Our 2500.PS8-R model power strip features the domestic, 3-prong, 360° Rotating North American Plug (NEMA 5-15P) and 6 x 180° Rotating NEMA 5-15R Receptacles with 2 x fixed NEMA 5-15R Receptacles. 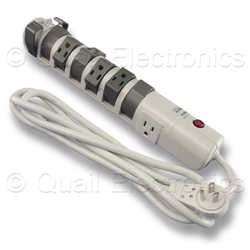 This North American power strip features a 6 foot power cord and a lighted power switch. 6 x 180° rotating outlets prevent AC/DC converters and other bulky plugs from bumping into each other, allowing you to make the most of your space. The cable management system guides your power leads away from the strip in an organized manner, helping to reduce clutter and tangling. The Rotating Power Strip features a 15A circuit breaker that backs up the surge protection, which in turn has a clamping voltage of 330V. The 2500.P8-R uses the powerful X3MOV to offer surge suppression up to 2160 Joules in less than a nanosecond of response time, with a lifetime maximum spike protection rating of 144,000A or 6KV. All 8 receptacles, 6 rotating and 2 fixed, are covered by surge protection. The surge suppression system is backed by Safety Shutdown Technology that appropriates thermal fuses to cut power in the event of an extreme, prolonged energy spike. Also, the high frequency scrubber prevents against EMI/RFI (electromagnetic interference). Status lights decorate this highly useful appliance, including a circular on/off switch that also acts as a circuit breaker. A green light operates in the absence of a grounded fault—if all your equipment is wired correctly, the bright green light will be on. Finally, a red light indicates that the surge and spike suppression systems are fully active. This part is on 14/3 SJT cable. It carries the UL and C-UL approvals and is rated at 15A and 125V.